Fold cream cheese ingedients together. You can also toss all the ingredients into a food processor, but I like a chunkier cream cheese. 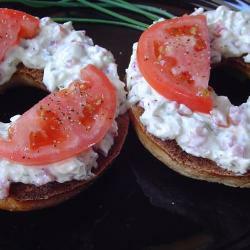 Slice bagels in half, lengthwise. Spread generously with cream cheese and top with tomato slices. I like to make sure every square centimeter is covered with tomato. Sprinkle with a little salt and a good amount of pepper; eat while still warm.